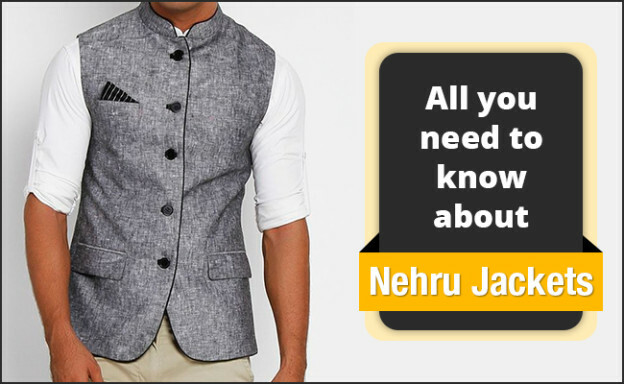 The very graceful and charming, Nehru jacket never goes out of fashion. Its elegance and simplicity have won many hearts. This timeless attire makes a big comeback in the fashion industry. Nehru jackets are available in many fabrics, colors and types to choose from. You can style them for any event or occasion such as pooja, a cocktail, a business meeting, wedding, or a casual lunch. This jacket can be paired with your jodhpuri pants, tweed pants, jeans, chinos, trousers or kurta-pyjama. The best advantage of wearing this versatile piece is it hides flabby stomach, which is definitely a common problem for many middle aged men. Sleeveless Nehru Jacket: Our Indian Prime Minister, Narendra Modi is mostly seen wearing this Nehru Jacket. You Must have this in your wardrobe if you want to look like a trendsetter. This type of jacket is perfect for your formal, festival, wedding and other occasions. Double Breasted Nehru Jacket: This type of jacket is more formal as compared to single breasted jacket. Certainly, it camouflages your snobby stomach and makes you slim. Velvet Nehru Jacket: The name says it all, Velvet Nehru Jacket is made from velvet fabric which uplifts your look thus making heads turn around wherever you go. But make sure you wear this in the evening. Particularly great for the winters. Striped Nehru Jacket: Stripes never go out of fashion and they are quite classy. If you want to be different from the crowd then this is just for you. Moreover, wearing vertical stripes crate an illusion for men with the short stature. Silk Nehru Jacket: Add an ultra-modern and a luxe touch to your look with silk Nehru jacket. This absolutely looks great when worn in the evening especially with tweed pants. Linen Nehru Jacket: This type of jacket gives the dual combination of modern and edgy look, thus, adding a style statement to your summer closet. Jute Nehru Jacket: Jute Jacket is famous among young generation. They love to show-off this jacket, no matter what season is. Khadi Nehru Jacket: Khadi has always been favorite amongst all and why not they are worn by many , no matter what the age is. Basically, they are good for both summer and winter and are comfortable to wear. Gentlemen! Refresh your closet with Nehru Jacket and rock your ethnic look effortlessly.